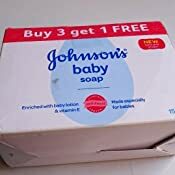 Amazon's Choice for "johnson baby soaps"
Sold by Cloudtail India (4.5 out of 5 | 73,078 ratings) and Fulfilled by Amazon. Gift-wrap available. Did you know? Your baby's skin has a natural protective coating of moisturizing oils that covers her skin's outer layer. If these oils get washed away, you might leave her skin vulnerable to dryness, irritation and rash. 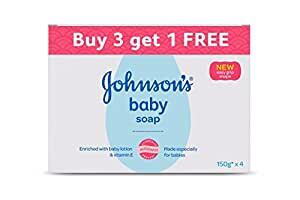 That's why Johnson's Baby Soap, made especially for babies, is enriched with 1/4th baby lotion and vitamin E to help preserve baby skin’s moisture. It's rich, creamy lather gently cleanses and helps keep your baby's skin soft and supple. It does not contain any parabens or phthalates and is a dermatologist tested product. Johnson's Baby Soap has been specially designed to have an easy grip shape. Moms trust Johnson's - always mild, gentle and effective. 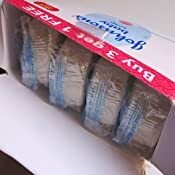 Hi friends got hands on about this product in youtube, To watch just type title of this product ,you will get my video, which will help you to some extent before you buy it, catch you in youtube , overall its a good product for the baby... Thk u. Too Expensive. Bought earlier at half the price. soap I feel this is better than the other available in the market. It is exactly how I wanted for my baby produces good amount of foam, moisturising and cleans the skin thoroughly. 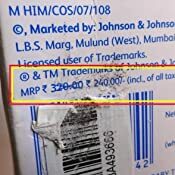 Product MRP is 240 only. Don't be fooled. Using it since i was born and now its been 23 years. 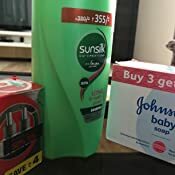 Love johnson's products. Best was its price. Pack of 3 soaps of 100 gm each for just 115 rupees. Can't get bettet deal anywhere.